And with that we hatched a plan where by Blondie would jet down to W&D on Park and 27th and I would head up to The Dessert Truck on Park btw 51st and 52nd and we would meet in the middle and unite waffle with mousse. Mmm. First we had to try each on their own. I have to say that the freshly baked liege was downright delicious. Alas, Blondie didn't get to see the ball of dough being pressed, as they already had a stack of waffles that had recently been made, but you could definitely taste the freshness. The inside was pleasantly doughy and chewy, and the outside lived up to it's promised increased "caramelization." 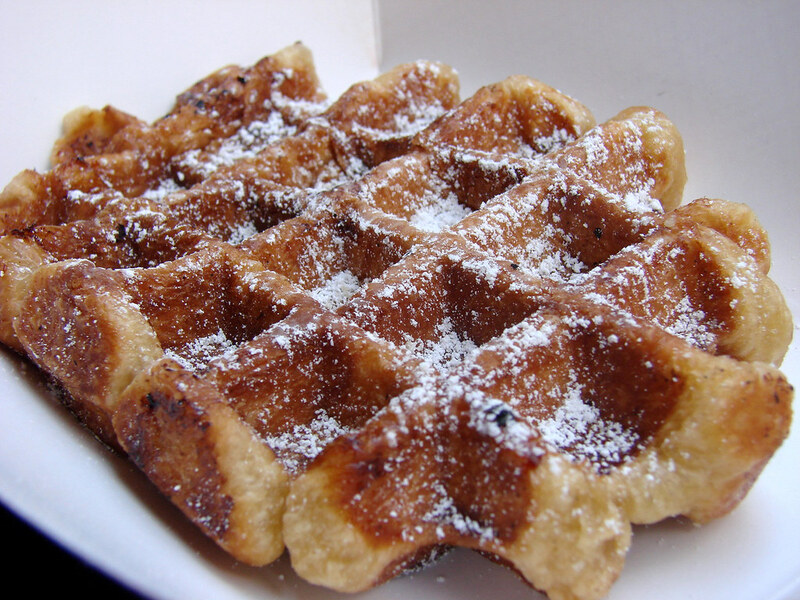 Over the past year I've had my fair share of liege waffles from W&D and this one ranked up there. As for the Milk Chocolate and Peanut Butter Mousse, that was freaking delicious. I normally am a dark chocolate girl who finds milk chocolate cloying and insipid. This was just right. 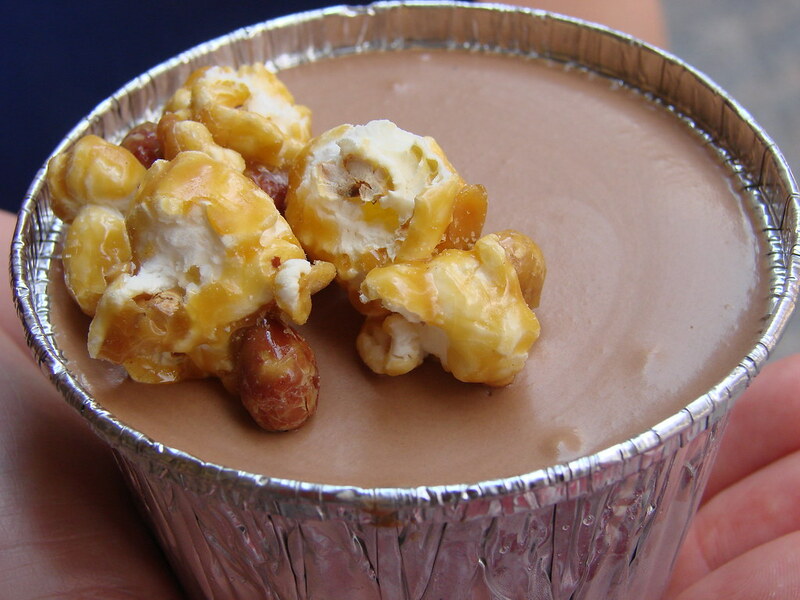 I enjoyed the balance of milk chocolate to peanut butter and the caramel corn on the top was an inspired choice. Blondie would have liked the mousse to have been airier, but it wasn't a problem for me. 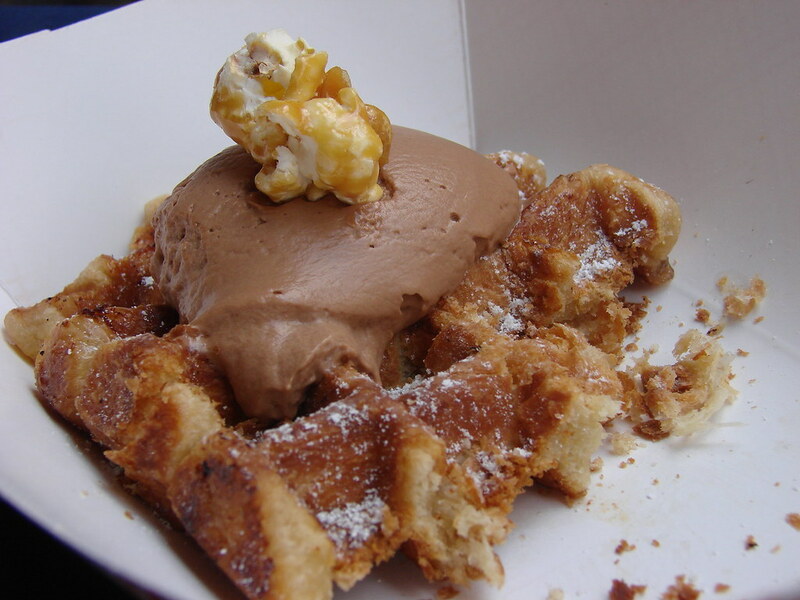 Now for the pièce de résistance--the fresh baked liege waffle with milk chocolate and peanut butter mousse. Oh man, that should be illegal. The mousse made for a sinful dinge and was a rich and delicious topping to the chewy and buttery liege. I'll be back for more of both though not necessarily paired together that way. That was one of those beautiful and shining moments that should maybe only happen once every five years. In any case, I'm happy that it did and that The Dessert Truck is making midtown its permanent daytime home. Amy from Sweet Freak suggested a three course Dessert Truck menu that sounded divine. 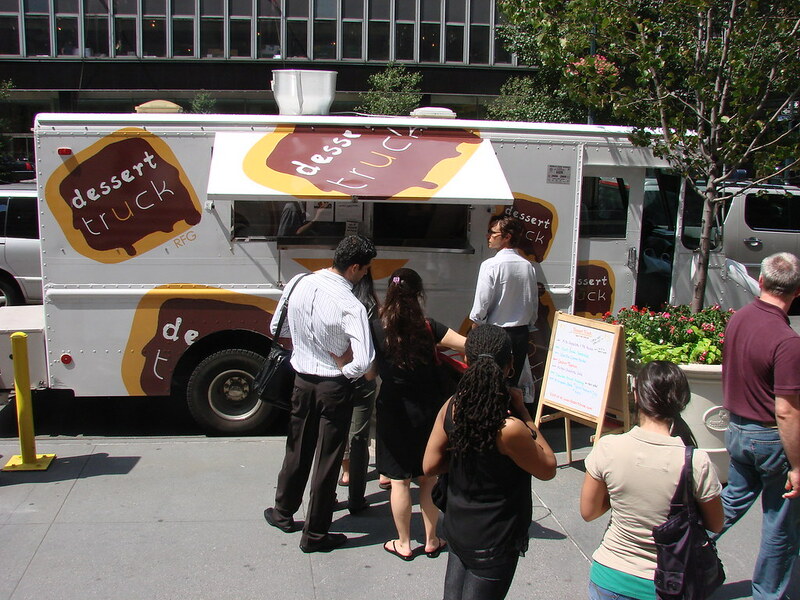 Given the wealth of desserty items sold from trucks in midtown I might suggest an amuse bouche of a chocolate dot from the Treats Truck, a liege waffle with banana and honey as a main course and then peanut butter and chocolate mousse from The Dessert Truck to round things out. Sigh, I love midtown. God, I need to get to NYC from VA soonest!! That combo is down right outrageous..
@danny: we were surprised about the pb at the bottom, too! I almost wish it they had a peanut butter blob in the middle. phillygirl: yes! you definitely should come for a visit. so much good cart (and truck) food! Daring Bakers August Challenge: Eclairs! Black & Whites at the Farmers Market? Pig Candy...where have you been all my life? It will always be Shea to me! Breakfast at Tiffany's, Lunch at...Duane Reade?